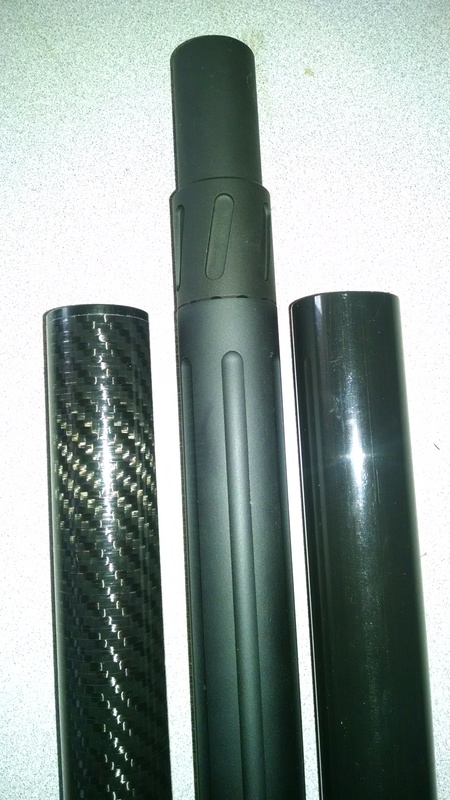 M3k 9 round with an Aluminum shroud shown with a Carbon Fiber shroud on left and a polymer shroud on right. Now you can have the same benefits on the M3000 our VersaTube gave the VersaMax! The stainless steel one piece tube eliminates the need for a clamp and removes the intermediate threads and nut to improve feeding reliability and slug accuracy. In addition, it greatly eases disassembly. The aluminum shroud protects the mag tube as well as provides a solid assembly. No other tube on the market except the stock FNH SLP™ tube, properly eliminates the stress riser due to the midtube nut and completely shields the tube installed into the receiver. These are two features we would not do without on a hard use autoloading shotgun, and now you don't have to do without either. The 8+1, 8+3 and 8+4 utilize the Nordic MXT extension components and are fully interchangeable. The 10 shot version uses our own hard coat anodized aluminum one piece nut/2 shot tube assembly that is very durable. Gunsmith installation suggested. Remove the stock magazine tube from the receiver and clean the threads with a solvent. In some cases, a heat gun may be helpful. Install the stainless tube until bottomed out. We have not used any threadlocker on some tubes and they work fine. If you use the included thread locker, remove the receiver strike plate, ensure the threads are clean and degreased first. If the loading port is opened, you will see the edge of the stainless tube protrude into the loading port. Mark with a sharpie, remove tube and remove the marked portion. Reinstall tube, install spring after clipping to desired length, install nut (without extension) until shroud is compressed. Thread extension into nut. Hand tight snugged up is plenty...don't crank down on the extension! The extension can be thread locked into the nut if you prefer. This is a great lightweight tube setup. Especially if you need to mount a light for a night match. Easy to install, and the carbon fiber looks great. I ran a 12 round tube in my gun.